Western Maine Family Health Center (Livermore Falls, Maine) seeks BC/BE Family Medicine Physician or experienced Family Nurse Practitioner with outstanding clinical and interpersonal skills to provide primary care to patients of all ages. As a NCQA-Patient-Centered Medical Home, we offer accessible, high quality healthcare with integrated behavioral health services. 2,300 people access services each year which include routine physicals, chronic disease management, substance use disorder treatment, and acute care. Livermore Falls is a town of 3,128 people located 30 miles west of Augusta and 16 miles from Farmington, the home of the University of ME at Farmington, a top ranked Liberal Arts University. Other towns in the health center service area bring the regional population to 18,000. Livermore Falls and the surrounding towns are renowned for hunting, fishing, skiing, and snowmobiling. Western Maine Family Health Center is part of HealthReach Community Health Centers, a system of 11 practices in Central and Western Maine with a 44-year historyserving 28,000 patients each year. We accept all insurances including commercial plans, MaineCare (Medicaid) and Medicare. In addition, through an ongoing grant from the federal Bureau of Primary Health Care, the health centers offer sliding fee services and assist with applications for healthcare and medication programs including the Health Insurance Marketplace. Download the FREE App to Find Upcoming Osteopathic CME Events Around the Country! Free "Know Your Doctor" Wheels Available! 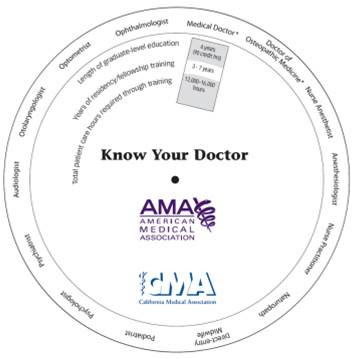 The “Know Your Doctor” wheel is an advocacy tool for use by members of the Scope of Practice Partnership (SOPP) to help legislators understand the differences in education and training between physicians and non-physicians. The wheel turns in a circle to highlight the education and training of non-physicians compared to physicians. The SOPP was founded in 2007 by AOA, the AMA and other state and specialty medical organizations to provide resources to help members combat inappropriate scope of practice expansion attempts by non-physician clinicians in their states. Membership is free for state medical societies, and currently 38 osteopathic state affiliates participate. The SOPP is funding “Know Your Doctor” wheels for use by its members during medical society lobbying days in 2018-2019, at no cost to SOPP members. This tool should only be used for legislative and regulatory advocacy. The wheels will be co-branded by the AMA and your organization. Get this tool FOR FREE from the MOA! Just call 207-623-1101 and we would be happy to ship copies to your office. Save more than 20% !! * OVER HALF THE VICTIMS OF THE MOST COMMON CAUSE OF SUDDEN CARDIAC ARREST CAN SURVIVE WHEN TREATED EARLY WITH CPR AND SHOCK FROM A DEFIBRILLATOR. Order NOW! Complete this order form and mail to the MOA Office with payment. The Physician Ambassador Program was created by the Department of Veterans Affairs as a best practice recruitment and placement initiative seeking fully licensed physicians and clinicians to enhance health care services for Veterans. The Physician Ambassador Program is a without compensation program that provides civilian physicians and clinicians an opportunity to give back to the Veteran community by serving in a volunteer role to deliver health care services to Veterans. If you are interested in participating in this program at VA Maine Healthcare System, please contact Jonathan Barczyk at (207) 621-4886. Classified Ads are free for MOA members.